Species has a small breeding population size and negative short-term population trends. Comment95 pairs documented in 2009 and 73 pairs documented in 2010 without all potential suitable nesting habitat being surveyed in either year puts total number of breeding individuals in the 250 to 1,000 individual population size class. Comment326 square kilometers based on Species Occurrence polygons with known breeding activity in the Heritage Program database. 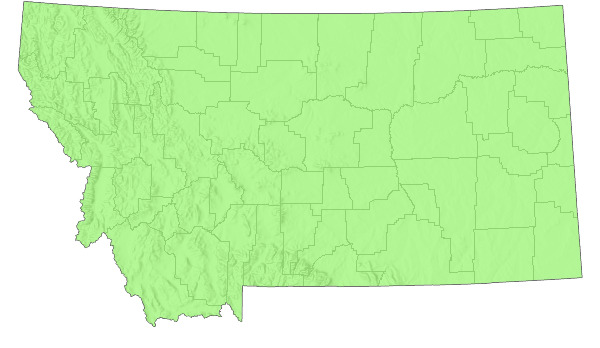 CommentWetland habitats within the range of the species in Montana are within +/- 25% of pre European levels. CommentBreeding Bird Survey (BBS) data for Montana is of low credibility at -2.3% per year or -26% per decade. BBS trend data of moderate credibility across Northern Rockies show an insignificant decline of -2.2% per year over last 10 years. Prairie Potholes shows a significant -3.8% decline per year over past ten years. CommentAltered hydrology, nest site disturbance, and climate change related drought all represent threats to Montana populations. CommentIf water levels are maintained then species should recover or remain stable relatively quickly, certainly within 10-50 years. Comment20-60% of wetland breeding habitats likely to be affected by ongoing drought and climate change. CommentNarrow Specialist. Species is dependent on large or small wetland complexes with floating vegetation for nesting. The head and body of breeding Black Terns are black, fading to gray on the rump. The undertail coverts are white. The upper surface of the wings and tail are dark gray, and the wing linings are pale gray. The leading margin of the wing from the body to the first digit is white. The bill is black and the feet are a dark reddish-purple (Goodwin 1960, Farrand 1983). Females are somewhat duller black than males, but this difference is often difficult to distinguish in the field (Goodwin 1960). Black Terns begin their prebasic (postbreeding) molt in late June when eggs begin to hatch. White feathers appear first around the eyes and cheeks, then on the forehead, neck, throat and breast, and finally on the abdomen. Heavily molting adults take on a peculiar, piebald appearance. The prebasic molt is completed during fall migration (Goodwin 1960). In basic (winter) plumage, the underparts are pure white except for a small, dark patch on each side of the breast. The back becomes a shade of gray similar to the wings and tail. A blackish cap joins black ear coverts on the otherwise white head (Goodwin 1960, Farrand 1983). The juvenile plumage is similar to the basic plumage, but the feathers of the back are darker and the wing coverts and cap are barred and scalloped brown (Goodwin 1960, Farrand 1983). The total length of adults is 23 to 26.5 cm (9 to 10.5 inches). Vocalizations include shrill, somewhat metallic alarm notes, described as "kik" or "keek", depending upon intensity and level of motivation, and a complex of contact calls described as "kyew", followed by one to four additional syllables, as "kyew-dik", "kyew-dik-ik", etc. (Goodwin 1960). The "kik" call commonly serves as a signal of impending danger in the nesting area. It may also be given during the ascent portion of the courtship flight. The "keek" call is similar to, but more shrill and forceful than, the "kik" call, and is given during aggressive attacks on enemies in close proximity to the nest. The frequency of repetition increases as they become more aggressive. The "kyew" calls are given as parents approach and leave the nest, during foraging flights, by adults accompanied in flight by young, by parents calling to young at or near the nest, by parents at the nest during incubation, brooding and feeding, and during the courtship flights (Goodwin 1960). Black Tern eggs are ovate with a tendency toward ovate-pyriform (Bent 1921). Ground color varies from dark olive to light buff with markings of dark brown and gray. Markings vary from small dots and scrawls to very large blotches and are often particularly heavy around the larger end of the egg (Goodwin 1960). The average dimensions for 122 eggs in the U.S. National Museum were 34 x 24 mm (Bent 1921). The distinctive black head and underbody, with gray wings, back, and tail easily distinguishes this species from any other tern species. Their size is also a key to recognition. They are very small compared to other tern species in the state. Only the Interior Least Tern (Sterna antillarum athalassos) is of similar size. Color will preclude any misidentification between these two species. Little information is known about Black Tern migratory patterns in Montana. They are more likely to move north from wintering locations through the interior of the U.S. (Heath et al. 2009), so early sightings should occur in southern portions of the state. Migrating Black Terns have been observed just north of Dillon as early as April. However, the majority of spring migration observations have been in May and June. Black Terns have been observed in transit in July and August albeit fewer observations, probably due to peak breeding. The latest recorded observation was in September near Medicine Lake National Wildlife Refuge in Sheridan County (Montana Bird Distribution Committee 2012). Migration in fall is less concentrated through the interior of the country as birds also move to coastal areas (Heath et al. 2009). Black Tern breeding habitat in Montana is mostly wetlands, marshes, prairie potholes, and small ponds. However, several locations are on man-made islands or islands in man-made reservoirs. Across all Montana sites where Black Terns are present, approximately 30%-50% of the wetland complex is emergent vegetation. Vegetation within known breeding colonies includes alkali bulrushes, canary reed-grass, cattail spp., sedge spp., rush spp., reed spp., grass spp., Polygonum spp., Juncus spp. and Potamogeton spp., indicating a wide variety of potential habitats are usable by Black Terns. Water levels in known breeding localities range from about 0.5 m to greater than 2.0 m with most having depths between 0.5 m and 1.0 m (Montana Natural Heritage Program Point Observation Database). During breeding season, insects and freshwater fish; rest of year diet consists mainly small marine fish and insects. Highly social species that nests semicolonially and often forages in flocks (Heath et al. 2009). Overall, little information about Black Tern reproduction is known for Montana, as very few studies concerning the species exist. Recent work has focused on location surveys and general population size (Feighley 1998, Rauscher 2000). DuBois (1996) did nesting surveys for Black Terns at a single location in the state (Freezout Lake). In Montana, Black Terns usually begin their reproductive cycle in early to mid-June. However, in 1991 five documented observations of nesting occurred in May (Montana Bird Distribution Committee 2012). DuBois (1996) recorded egg-laying as early as June 2nd. Black Terns are considered a single brood species and egg-laying late in the season is thought to be a renesting attempt after an initial nest failure. Egg-laying has been recorded in Montana as late as June 27th (DuBois 1996). The average Black Tern clutch size is 2.6. A three-egg clutch is very common, although clutches from 1 to 6 eggs are possible (Heath et al. 2009). DuBois (1996) found the average clutch size to be 2.74 among 19 nests at Freezout Lake Wildlife Management Area. Hatching is thought to occur approximately 20 days after egg-laying with an asynchronous hatch sequence (Goodwin 1960). The earliest hatch date in Montana is June 22nd (DuBois 1996). Young are mobile within days of hatching. Continued monitoring is challenging as young will leave the natal nest site when threatened and adults will even relocate to a new area. Fledging typically occurs between days 20 and 24 (Bailey 1977). DuBois (1996) did not indicate any young fledged from the monitored colony, but did report newly fledged young participating in mobbing at the colony. No information is available regarding fledgling or juvenile success in Montana breeding colonies. Active management for Black Terns in Montana is currently limited to continued population monitoring and water level fluctuation control. Several Black Tern colonies are under federal or state control and monitoring of the population at those locations is completed annually. This monitoring can range from basic observation counts to nest location surveys. At some sites, federal or state agencies also monitor and regulate water levels during the breeding season for Black Terns, as well as other wetland species and waterfowl. Both population monitoring at perennial breeding locations and water level regulation should be continued on an annual basis and be expanded to other locations where Black Terns breed in the state. Bailey, P. F. 1977. The breeding biology of the black tern. M.S. thesis, University of Wisconsin, Oshkosh. 67 pp. Bent, A. C. 1921. Life histories of North American gulls and terns. U.S. National Museum Bulletin 113. Washington, D.C.
DuBois, K. 1996. Black Tern nest monitoring at Freezout Lake WMA. Montana Dept. Fish, Wildlife and Parks. Unpublished report. 7 pp. Farrand, J., ed. 1983. Audubon Society master guide to birding, 3 volumes. Alfred A. Knopf, New York. 1244 pp. Goodwin, R. E. 1960. A study of the ethology of the black tern,chlidonias niger surinamensis (Gmelin). Ph.D. dissertation, Cornell University, Ithaca, New York. 193 pp. Rauscher, R. L. 2000. 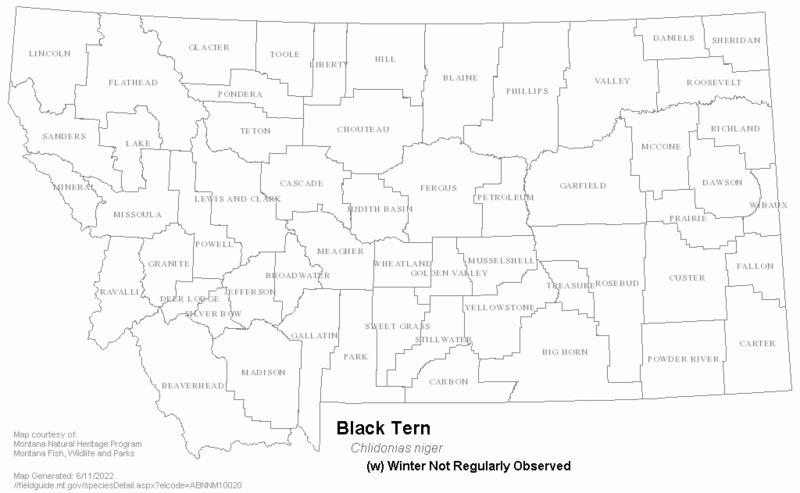 A survey of black terns in Montana. Montana Fish, Wildlife and Parks, Nongame Program, Bozeman, MT. 36 pp. Brown, M. and J. J. Dinsmore. 1986. Implications of marsh size and isolation for marsh bird management. J. Wildl. Manage. 50:392-397. Burleigh, T. D. 1952. Spring migration. Audubon Field Notes 6:258-260, 291, 292. Chapman, B.A. and L.S. Forbes. 1984. Observations on detrimental effects of great blue herons on breeding black terns. Journal of Field Ornithology. 55(2): 251-252. Delehany, D.J. and W.D. Svedarsky. 1993. Black Tern colonization of a restored prairie wetland in northwestern Minnesota. Prairie Nat. 25:213-218. Feigley, H. P. 1997. Colonial nesting bird survey on the Bureau of Land Management Lewistown District: 1996. Unpublished report, U.S. Bureau of Land Management, Lewistown, Montana. Kantrud, H.A. and R.E. Stewart. 1984. Ecological distribution and crude density of breeding birds on prairie wetlands. J. Wildl. Manage. 48(2): 426-437. Land & Water Consulting, Inc., Missoula, MT., 2002, Montana Dept. of Transportation Wetland Mitigation Monitoring Report, Year 2002: Circle Mitigation Site, Circle, Montana. Proj. No. 130091.039. February 2003. In 2002 Wetland Mitigation Monitoring Reports, Vol. I.
Morrison, M. P.O. Box 398, Wilder, VT.
Muller, S.L., I.M. Mazzocchi, and K. Loconti-Lee. 1992. Black tern (Chlidonias niger) investigations in New York state, 1990 and 1991. New York State Department of Environmental Conservation, Watertown, New York 35 pp. Novak, P.G. 1990. 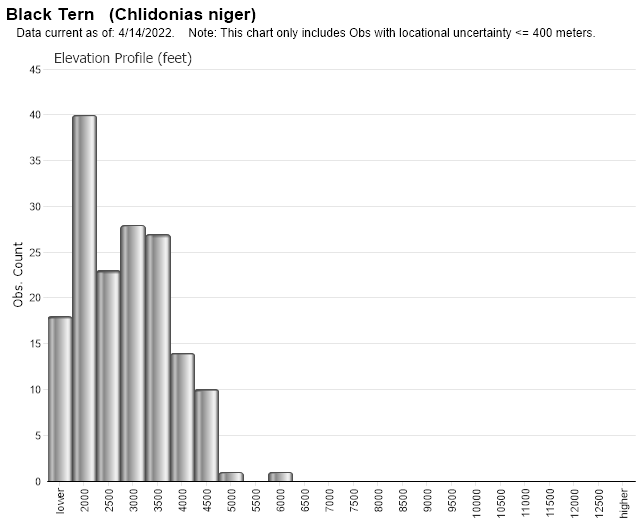 Population status of the black tern (Chlidonias niger) in New York state, 1989. New York Sate Department of Environmental Conservation, Division of Fish and Wildlife, Nongame Unit, Delmar, NY. 30 pp. Novak, P.G. 1992. Black tern, Chlidonias niger. Pages 149-169 in K.J. Schneider and D.M. Pence, editors. Migratory nongame birds of management concern in the Northeast. U.S. Fish and Wildlife Service, Newton Corner, Massachusetts. 400 pp. Rabenold, P.P. 1986. 1986 survey of black terns (Chlidonias niger) breeding in Indiana. Unpublished report, Indiana Department of Natural Resources, Division of Fish and Widlife, Indianapolis. 17 pp. Rabenold, P.P. 1987. 1987 survey of black terns (Chlidonias niger) breeding in Indiana. Unpublished. report, Indiana Department of Natural Resources, Division of Fish and Widlife, Indianapolis. 13 pp. Raffaele, H. A. 1983. A guide to the birds of Puerto Rico and the Virgin Islands. Fondo Educativo Interamericano, San Juan, Puerto Rico. 255 pp. Richardson, F. 1967. Black tern nest and egg moving experiments. The Murrelet, 48(3):52-56. Williams, S. O. 1983. Distribution and migration of the black tern in Mexico. Condor 85:376-378. Web Search Engines for Articles on "Black Tern"